View More In Laser Distance Meters. 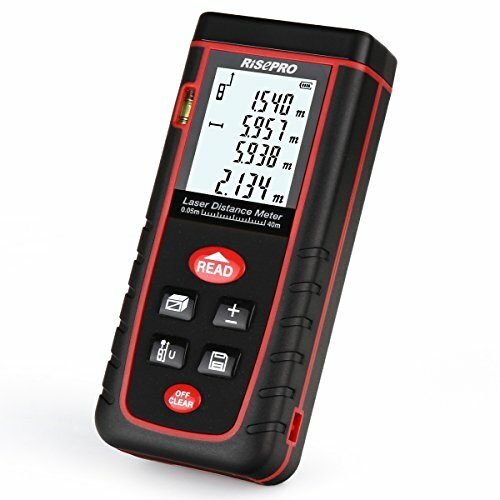 FAST & SIMPLE TO MEASURE DISTANCE - With an easy targeting laser pointer, you can now get your complicated range finder works in a fast and simple way. Ideal for variety of fields: home, property, construction and any other range finder fields. RANGE & ACCURACY - It measures from 0.05 to 40meters and highly accurate up to +/-2mm. There are multiple parameters for selection such as meter, inch and ft to accommodate both imperial and metric users. COMPACT & RIGID - The mini and compact size makes it perfectly fit for one hand operating. The rigid casing is well built by top quality materials and made for heavy duty users. MULTIPLE FUNCTIONS - Includes: Single Distance Measurement, Continuous Measurement, Area Measurement, Volume Measurement, Pythagorean Proposition Measurement, Addition or Subtraction Function and etc. OTHER USEFUL FEATURES - Self Calibration, Max or Min, Data Record, Backlight, Auto Shut Off and etc. If you have any questions about this product by RISEPRO, contact us by completing and submitting the form below. If you are looking for a specif part number, please include it with your message.